Salam ladies! How's Ramadhan treating you? Hopefully everyone is having a blessed Ramadhan so far insyaAllah! Can't believe it's already the last 10 days of Ramadhan! Wowsers. Guess what!? (you're not guessing are you? (-_-)) Fashion Valet just launched a Raya Campaign on their website. The campaign is basically to get to know your personality more and make it easier for you to shop according to what best suits your personality! Cool huh? I took the quiz and apparently I am a classic 'Junaidah' who will always go for a timeless look and a bit of a glamorous girl! 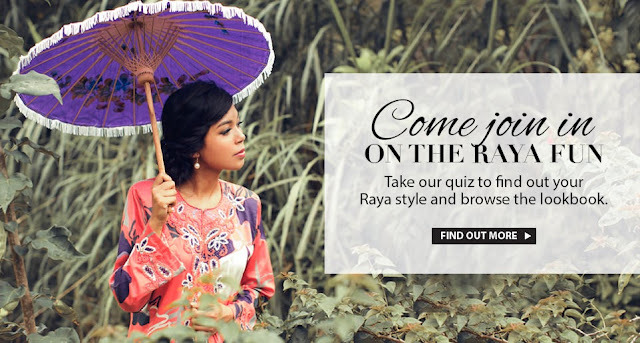 You too can take the quiz HERE to find out which kind of Raya style is your style. Don't forget to get the ball rolling by simply sharing your results on facebook! Also, if you're on Instagram, post your favorite things with hashtag #mykindathing ( it could be anything and everything- kuih raya, favorite hangout places, hobbies, shoes, there's really is no limit!) Post as many photos as you fancy, because something special might just come your way! So don't forget to join in the fun and also check out new arrivals on FV!